In this CELL, students perform experiments to model the process of information transfer from DNA to RNA to protein. Students then model mutations and the resulting changes in RNA and proteins. Students examine the relationship between protein structure and function. Finally, students investigate mitosis to demonstrate how a change in one cell’s DNA could affect the entire organism. Through experimentation and data collection, students address the following type of questions: How does DNA control functions of an organism? Can changes in DNA cause changes in an organism? Why can mutations in the DNA of a single cell affect the functions of an entire organism? Introduced to transcription, the process by which DNA sequences that code for proteins are translated to the corresponding RNA sequences. Study translation, the process by which the RNA code is used by the cell to build a protein. Investigate three types of mutations: substitution, insertion, and deletion. 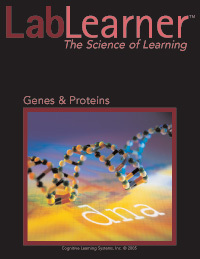 Study how mutations in DNA can cause changes in protein structure and function. Learn that mutations in DNA do not always lead to changes in structure or function. Use models and prepared microscope slides to study mitosis. Learn that mitosis is the process by which mutations can be passed on from one cell to another. Demonstrate mastery of the concepts by building a model protein, mutating the protein to increase its activity, and determining the corresponding changes in RNA and DNA that must occur to form the mutant protein.